The third game in the incredibly popular Assassin's Creed series is here, bringing more of the murdering, looting, conspiracies and free running that we have been in love with since 2007. Instead of a new Assassin, you take control once again of Ezio Auditore, the badass protagonist from the second game. Is Brotherhood worth a retail release, or is it just big DLC? Read on to find out. The first thing you'll notice about this game are the graphics. As always with Assassin's Creed games, they are among the best on the system. Each game pushes the limits a little further than the previous, and it pays off. The detail on Ezio's cloak is astounding, the draw distance is great, the water shimmers and reflects in all the right places, the list could go on. Ubisoft have pushed the boat out once more to create a beautiful, realistic world. The world in question is Rome. Rome played a big part in the previous game, but nowhere near on this scale. Instead of being one of a few locations, the game pretty much sticks to Rome, with a few small sections in other places. It has grown immensely since Ezio was last seen here, and now has many districts and monuments, including the world famous Colosseum. Again, the detail is breathtaking. The city feels alive. The local drunk sleeping in an alley, the homeless on their knees, begging for money, the rich gathered in elite groups in the clean parts of the city. The guard positions even change at night time. A lot of time has been put into making Rome the best area in the series so far. 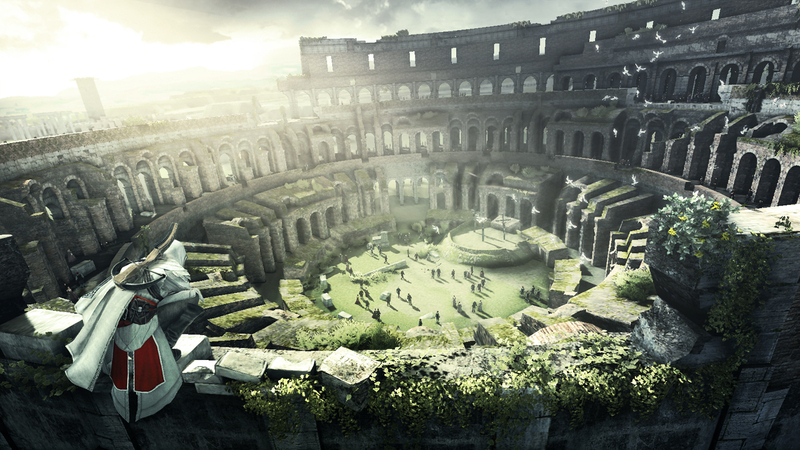 Being an Assassin's Creed game, Rome is also filled with the stuff of parkour dreams. Beams, poles, ladders and all the rest return to make this a free running playground for Ezio. A new feature which often shakes up chases and escapes is the lift. Grab the rope, kick a lever and the weight drops, launching you skyward, and depositing you safely on the roof. It is awesome to see and incredibly helpful when a large gang of guards is pursuing you. They aren't as common as the hide spots and other free running sections which is a good thing. They're so helpful in your favour that finding one on every corner would dramatically reduce the difficulty, which is already close to perfect. Perhaps the biggest new feature, and one of my personal favourite features of the entire series, is the ability to recruit and new assassins, and use them in a variety of awesome ways. To recruit people, you must find some opposed to the guards. Usually surrounded by guards with swords drawn, help them to be victorious and they will join your cause. Once you have done so, you can go to a hideout or pigeon coop and see their stats, level and weapons, send them around Europe to complete contracts and assign skill points to armour or weapons. For each contract completed, the assassin's which took part gain experience points, and bring back money and trade items. It's an amazing feature, and is very addictive, even though you do not take part in the contacts. Levelling up your minions is always satisfying. If your assassins aren't out completing contracts, you can utilise them in a number of ways to help you out directly. Can't get past a large number of guards to kill your target? Simply call for your assassins and within seconds they will have either created a distraction, or killed the target. Lock on to your priority target and that is who will die first. Other guards nearby will rush to defeat them, but usually with not much luck as your high level assassins utilise smoke bombs and pistols. A nice feature if you have enough recruits, is to target a group of guards, hold the assassin signal button and arrows will fall from the sky, killing all of the guards. It is a quicker and more discreet way of getting rid of groups. The assassin's are an incredible new feature, one that hopefully they will include in sequels. The variety of ways in which they take out your target or create distractions makes it so much fun each and every time, and the higher level recruits will take out targets more stylishly than you could dream of. Renovating shops and buildings is back, but no longer confined to Montigerroni. Renovate an art shop to buy some new paintings for your hideout. Renovate a few more art shops and you'll get a discount. A new feature is the ability to renovate faction buildings. You can convert the empty building into a headquarters for courtesans, thieves or mercenaries. In doing so, you unlock challenges for each group, which in turn open up more missions and rewards. There are now tunnels which, for a small fee, can be fixed up and used for fast travelling around the map. They're incredibly helpful in getting to the far reaches of the map. You can also renovate monuments and landmarks, greatly increasing the income of Rome. To be able to renovate buildings, you must first destroy the local Borgia tower. Before you can do that however, you must kill the Captain of the area. Not an easy task, as these areas are overflowing with guards, but clever use of your assassins can make this much easier. Once you kill the Captain, destroy the tower and the Borgia presence is greatly diminished. The storyline is once again fantastic. The jump from the first game to the sequel was of course a huge change, and Brotherhood expands the storytelling from AC2 with even more varied missions and characters. Ezio must hunt down Cesare and Rodrigo Borgia and kill them, for the good of Roma. The game picks up literally where the last one ended. Ezio is still in the hidden room in the Vatican, utterly confused by the revelations for Desmond. You leave the Vatican and return to Mario's Villa, where you are reunited with Ezio's family and greeted by many admirers. All seems well, until a sudden attack on the town causes chaos and many deaths. Ezio realises he must return to Rome, and finish what he started. Upon exiting the Animus, Desmond finds himself in Montigerroni, the very place he has just visited as his ancestor. Finding a way into the villa, your colleagues set up base as you find appropriate power sources. This is the first Assassin's Creed game which gives you a full, modern town for Desmond to explore using his parkour skills. There are no inhabitants as the historical city is closed, but each game sees us getting one step closer to a living city, and a huge playground for Desmond. time to create a more immersive experience. As that's the case, I bet I'm not alone in being extremely excited for AC3.